Whenever I go looking for a particular sub-species, sooner than later, they tend to show up. I had recently written about how much I wanted to see Plum-Headed Parakeets. About a week later, in Kerala, I spotted a large number of them on different occasions. Each one – an apple tart, wrapped in painted cabbage leaves, with wings. There were so many flying around, from one tree to another in search of food. I wanted to curl into a foetal position by the side of the road and wildly smile until nice people in white coats chaperone me to a happy and well-padded place. But I wasn’t able to photograph any of them to my heart’s content. Every time I saw them, I began panicking about how gorgeous they looked. There was so much beauty in them that my fingers trembled whenever I tried to click just a photograph. I could have handled it if it was a single one or just a pair. But there at least 6-8 of them every single time. It was too much for me to handle with care. Even when one separated herself briefly from the flock, I wasn’t able to do her justice. The photographs, except for a few, ended up looking as though they were drugged and had their kidneys stolen. 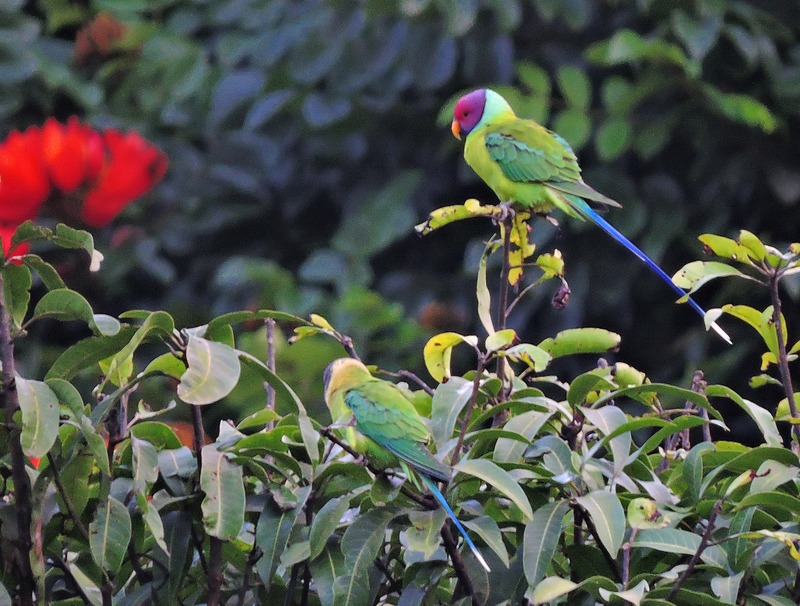 On the final day, a flock of Plum-Headed Parakeets dropped by to say farewell. There were about four couples. And let’s just say that they won’t be calling me anytime soon to take their family portraits. I don’t mind at all. Just as long as they keep showing up. oh I’m so glad there is someone else like me who has this problem when photographing birds! Really is just luck sometimes, having said that think you have some fabulous shots here and I’m sure they will be in touch for that group photo on their return. D’aww knuckle bump, dear friend. It is definitely luck more than anything else for me. I was spazzing out and stuff happened! Thank you for your lovely comment, Becks! They are truly splendid creatures and your photos are a joy for me to behold. Thank you. I am so glad I could bring in joy through them to you, soak away dear friend! I love all creatures, and birds are a favourite. Thanks Govind! That’s some garden you have, count yourself exquisitely lucky! I love your prose. Your poetry too, of course. So maybe its the cross-pollenization I’m enjoying.